After becoming very involved with Ghanaian drumming in the GTA, I decided to take things one step further and travel to the Volta Region of Ghana during the summer of 2005 to learn more about the culture and the people. I was moved by the experience and decided to return as soon I as could. In 2008, when I returned to Ghana determined to create my own drum, I did some travelling, ended up in Dekpor, and, being a teacher, I wanted to see the village school. The condition of it was appalling: no doors or windows, gaping holes in the roof, deteriorated floors, extremely 'basic' furniture, and the chalkboard of each indoor classroom consists of black paint that has been painted onto the cement bricks. The primary rooms are simply tree limbs marking an area attached to the back of the school. There is no kindergarten room. Classes have to be cancelled if it rains, as there is not enough shelter from the elements. The school's timetable included a time slot for library – but there are no books for student use, never mind a library! Upon my return to Canada in August 2008, I was determined to find a way to help. I couldn’t pretend that I hadn't SEEN the sad state of affairs at the Dekpor School. I called on friends and colleagues and collected over 600 children's books and some cash donations. 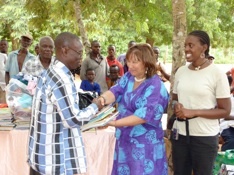 July 2009, I decided to take a leave of absence from TDSB, and I returned to Ghana to offer the donations I had collected to Dekpor School. The reception I received was unbelievable, as this was a HUGE gift, in their eyes. There was a celebration that included all of the students, their parents, the town elders, the headmaster, the Queen Mother and the chief! Since I have been here, Dekpor School Development Organisation has been working hard to accomplish a lot! We are registered as an NGO, have a Board of Directors both in Ghana and in Canada, have hosted 8 Canadian teacher volunteers during the month of July, finished building the library, and we are continue to make positive changes to assist the children and community of Dekpor. For most families, it is a daily struggle to keep their children in school — there are many who simply cannot afford to send their kids to school at all. The need is truly overwhelming. Our child sponsorship programme is now underway. Not only do many students require support, but Dekpor School desperately needs MORE teachers. The class sizes are huge! I was shocked to discover that the kindergarten teacher has 150 children and no classroom. Imagine all these children crammed together on benches outside under a tree? As well as a child sponsorship programme, we have decided to also start a Sponsor-a-Teacher option. With the completion of the library, we hope to train two librarians to offer classes, not only to children, but also to adults so that basic literacy can be learned. Sponsorship of these librarians will make a huge difference to many people in the community. My dreams have expanded as future plans include involving more people, fundraising to repair and construct more classrooms, inviting more volunteers to work with the students and teachers in the classrooms and to basically make this school a great learning environment. Right now, things are pretty dismal as can be seen in the photos. The hard working parents are mostly subsistence farmers and there is little money to be spent on school expenses. Canadian teachers are doing the best they can to support this wonderful community, but we need more help. The Dekpor community members fully recognize that this is a hand up, not a hand out. Please, do what you can to help.